This morning, Mark and I drove up to Natick, MA to witness, cheer on and just be part of this legendary Boston Marathon. 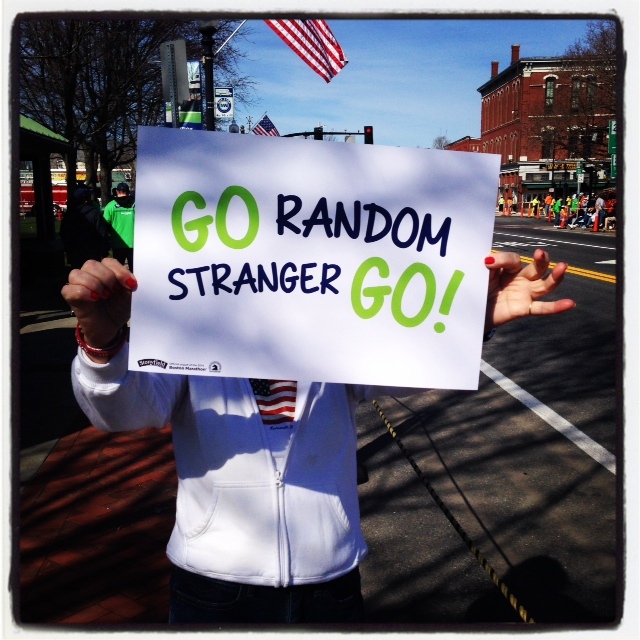 In light of what happened last year in our beloved city of Boston, we just felt that we wanted to cheer on the runners. As we watched the wheelchair participants, we were in awe of their determination. They are all tucked into their wheelchairs with their heads down and eyes focused on the road and what’s ahead of them. Some were paralyzed and some were amputees, but all were determined and focused. And then the Holy Spirit tapped me on the shoulder and reminded me of the times that I lose focus by the little distractions around me, little annoyances that are so insignificant in the bigger picture. I need to keep my eyes on the race, ignore the distractions on the sidelines and look toward the reward at the end. If you ever want to get a picture of this verse, go to a marathon! I was cheering on random people whom I have never met and whom I will probably never see again. I just kept thinking “There are days when I feel as though I’m running this race called ‘Life’ on my own, nobody really understands my frustrations, etc.” and then this verse reminds me that I, and my brothers and sisters in Christ, have this great cloud of witnesses cheering us on! They know my name! They know what I’m racing against and what I’m racing towards! They are cheering me on from Heaven!! They are screaming, and I hope they have some cow bells, and they are yelling “Go, Terry!!! You’re almost there!! You’re almost over “Heartbreak Hill!” You can do it!! Hang in there!! Don’t give up now! Stay focused! Don’t let the enemy distract you or slow you down! !” What an encouragement for us believers to know that we have the likes of the saints of the Old and New Testament, family members and friends who have gone on before us cheering us on!! I’m counting on my sister, Naomi to have a big old sign saying “Go Terry” and ringing her cow bell for me!! Well, gotta run….my sneakers are ready to be laced up and hit the pavement! !